A few weeks back, I was in Bogor, a city in Indoensia, which is called ‘The Rainy City’ due to its high rainfall throughout the year. Each time I travel to Indonesia, I see something new, which is actually a few countries clubbed together, given the vastness of the geography and the rich and unique diversity of each region. Indonesian cities are densely populated. City streets are overflowing with never-ending processions of cars, busses, motor cycles and scooters. Main cities have toll-based express ways. But still, traffic is a major problem. The traffic gets spread from city centers to the networks of by-roads as well. What attracts me always is the common sight of informally-clad people, often young men, standing in the middle of a cross-section of roads and controlling traffic. One can see a great deal of enthusiasm and energy among these young men who control traffic. The rhythmic movements of their hands remind me of Kandyan dancing. The whistle is blown quite often, at times for no reason. 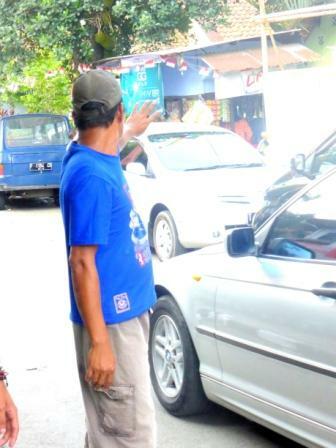 The commuters on vehicles obey these ‘informal traffic sergeants’. The interesting feature is that these men keep a hat with them and quickly direct it to the drivers of the vehicles to get some money, if not a Gudambarang cigarette! These men are called ‘polisi-cepeks’. In Bahasa Indonesia ‘cepek’ means ‘hundred-bucks’ and ‘polisi’ means Police. So ‘polisi cepek’ is ‘hundred-bucks-police-cop’. ‘Polisi-cepek’ had come into usage because these informal-cops expect at least 100 Indonesian Rupiah from each vehicle that passes by, especially, at peak traffic time when the movement of traffic time is slow. Now the norm for this ‘fee’ is 1000 Indonesian Rupiah (US $ 8 cents). Although one guy does the job of a traffic sergeant, he has a little gang of young men around to support him. The gang is a sort of pressure-factor for people to comply the ‘fee’-requirement. If one doesn’t comply, there’s a cost that one has to pay. The gang would scratch the paint of the car. Or break a side mirror. 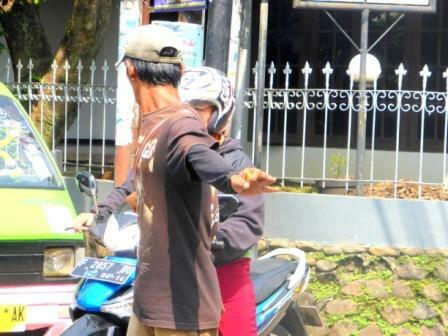 Enforcement of Polisi-Cepek-Law for the offenders is on-the-spot! The official Indonesian Police sometimes allow the ‘polisi-cepeks’ to do the job they are supposed to. My friends in Indonesia say that cops take a good rest and have a meal from a wayside ‘warteg’, an eatery, while their job is carried out by the ‘polisi-cepeks’. The city I was staying in Indonesia, Bogor, has a Presidential Palace. 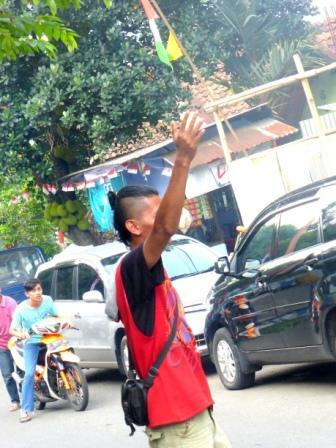 One of the tourist attractions in Bogor is an ultra-animated ‘polisi-cepek’ controlling the traffic just in front of the Presidential Palace. He’s considered an entertainer. This reminded me of an extra efficient traffic cop who used to stand in between Dehiwala and Wellawatte on the Galle Road. He was affectionately called ‘kaaperiyaa’, for his dark complexion and resemblance to an African. The commuters used to throw diaries and calendars to this traffic cop in the beginning of the year as a gesture of their appreciation of the cop’s persuasive and efficient manner of traffic control. This was a few years, if not a decade back. Traffic control is an extension of the Law & Order System which is considered a Public Good. The conventional understanding is that Law & Order is one of the State’s main responsibilities. Over the last couple of decades the discourse on Public Goods went through major changes. One salient trend was on ‘privatizing’ Public Goods. This trend became prominent, and even a conditionality, in the wake of the Washington Consensus. The proponents of the Washington Consensus, particularly the multi-lateral agencies such as the World Bank, promoted policy changes on Public Goods. The same band of agencies promoted entrepreneurship and innovation as triggers to progress and growth. I was thinking about the ‘polisi-cepeks’ from a Public Good perspective. What exactly are they doing? Is this a form of entrepreneurship and innovation by young people in Indonesia who generate their self-employment in a country where 20 million people are unemployed? (I recall a former Sri Lankan President, R. Premadasa, generating employment to thousands of people to manually operate make-shift-bamboo rail-gate system at a time accidents became rampant due to the lack of gates on railway-crossings). Or is this a variation of privatizing Public Goods? Or is it a trend of taking the law unto themselves by thugs? Yesterday’s Sinhala papers carried news items and pictures of a group of youngsters from Deegama, coming under the Wellawa Police Division of the Kurunegala District, who captured a so-called ‘Grease Gamini’, who allegedly abducted a four-year girl from Nikadalupotha in the Kurunegala District. The pictures of the ‘brave’ youngsters from Wellawa, as reported by the media, reminded me of the ‘polisi-cepeks’ I saw in Bogor, Indonesia. The media also reported that the people wanted to treat the ‘Grease Gamini’ a la severe punishments meted out in the King’s days by ‘breaking legs’ (raja dawase wage a(n)du kadalaa daanna ohne). Today’s news papers reported that ‘Grease Gamini’, the suspect who is changed for abduction, was admitted to the hospital soon after the court hearing as he was very badly injured by the assaults from those who caught him. Well, we have a King and an undeclared Kingdom which is also called, the ‘Domestic Socialist Republic of Sri Lanka,’ according to a modern stone-plaque in Anuradhapura, of which a picture was posted recently in the Facebook of Hon. Dr. Harsha de Silva, M.P. 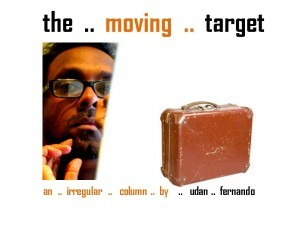 And the subjects are beginning to take over the delivering of ‘Public Goods’. Let the Police of Wellawa raise a toast. And our salutes. ‘Long live the King!’ !